So, finally, you’ve decided to go Keto and researched all the foods you should be eating on a Keto diet. Now its time to take it to the next level, by complementing those foods with supplemental nutrition to maximize your results. These supplements can be found in your grocery store or online and are very affordable, and as a bonus, you may already have some of them in your Kitchen. When many people hear supplements, they immediately think Fish Oil and Vitamin D, but in this list, you will find items such as Coconut Oil and Creatine which can be added to your cooking or smoothies very easily and require no extra effort. Fatty fish are one of the best foods you can eat to help you have a successful Keto diet. Hence, fish oils is one of the most important supplements you can take to complement your fish intake. They are rich in omega 3 fatty acids which results in amazing anti-inflammatory properties. Omega 6 rich foods such as dairy should be consumed as little as possible on a Keto diet, so to ensure you are getting those acids elsewhere, stocking up on omega 3 foods and supplements will help combat the pro-inflammatory nature of omega 6 foods and prevent systematic inflammation. Inflammation has been shown to cause an onset of chronic illnesses and diseases such as diabetes, arthritis, cancer and cardiovascular problems. Why Fish Oil on a Keto Diet? Consuming fish oils not only help to protect you against diseases but propel your results on a Keto diet by assisting your body to stay in Ketosis longer. Creatine is a popular supplement used by bodybuilders and athletes to help rebuild the body and aid muscle growth. It also assists with energy production and is a favorite among Keto dieters as well due to the increase in endurance and stamina it offers, especially for those high energy workouts. Our bodies produce creatine naturally, but as we age, production declines, hence the need to take a good supplement to replenish our depleting stock. Why Creatine on a Keto diet? It helps to build lean muscle mass, provides energy, improves strength and endurance. MCT Oils (medium-chain triglycerides) are a form of fatty saturated acids that has numerous health benefits, which range from improved cognitive function to better weight management. Found in oils like that of coconut and palm, MCT oils are used for energy right away, which sets them apart from other fatty acids. They digest easily and are sent directly to your liver, where they have a thermogenic effect and the ability to positively affect your metabolism. They are burned for energy instead of being stored as fat. They contain antioxidant properties, which helps to fight inflammation and improve heart health, brain health and prevent obesity. On a Keto diet you are lowering your carbs, this means you stand a big chance of lowering your electrolyte levels as well. This is due to the fact that you are cutting out the most important sources of electrolytes; starchy foods and vegetables. Low electrolytes is one of the main causes of the Keto flu. Low electrolytes can cause dizziness, fatigue, and muscle cramping, which are all symptoms of the Keto flu. These symptoms are not the most welcoming and they will make you want to give up. Therefore, it is best to start taking electrolytes from the get-go. Why electrolytes on a Keto diet? Ward off and prevent the Keto flu, improve muscle function and heart health. Vitamin D is a fat-soluble nutrient that also functions as a hormone in the body. It is found naturally in a few foods such as fatty fish (e.g. tuna, salmon, mackerel, sardines). Many dairy products are also fortified with Vitamin D.
However, too much sun exposure can lead to skin cancer, hence, doctors suggest that vitamin D be obtained through supplements. It is recommended that you take a dosage of 4000 IU/day to compensate for what we don’t receive in our diet. Why Vitamin D on a Keto Diet? Vitamin D is an important nutrient that aids in many body functions and with a majority of the population being deficient, it is good to supplement for optimum health. Just because a Keto diet mostly focuses on fats does not mean you don’t need a decent supply of low carb veggies to provide additional nutrition, especially fiber. Vegetables like broccoli and other greens are a great source of vitamins and minerals, plus they are low carb foods which help to keep your body in ketosis much longer. Adding a fiber supplement to your Keto diet will leave you feeling full longer, improve regularity and influence better gut health. the carb count in fiber supplements can be more than their actual vegetable sources, so make sure to read labels so you are not going over your daily carb count. A fiber supplement made with fatty grains like flax seed or chia seed will be much better than one made from over-processed ingredients you can’t pronounce. Why take fiber on a Keto diet? Fiber improves gut health and bowel regularity while offering you additional nutrients you need to get the best out of your Keto diet. Fish oil supplements have been proven to help lower high triglycerides. However, Spirulina has also been found to lower LDL cholesterol. Typically known as “bad cholesterol” an increase in LDL is said to cause cardiovascular disease, Some studies show a high correlation between LDL cholesterol and the risk of cardiovascular disease in both men and women. “In a research study from 2007, Mexican scientists assessed the effects of spirulina on triglycerides and LDL cholesterol. In their intervention, Torres-Duran et. al recruited 36 subjects (20 women and 16 men) and had them take 4.5 grams of spirulina supplement per day for six full weeks. The subjects were all of Mexican origin, did not have a history of cardiovascular disease or diabetes, and were aged 18-65 years. Furthermore, they had no history of taking medications that impact levels of insulin, blood sugar, cholesterol, or insulin such as statins. Why Spirulina on a Keto diet? 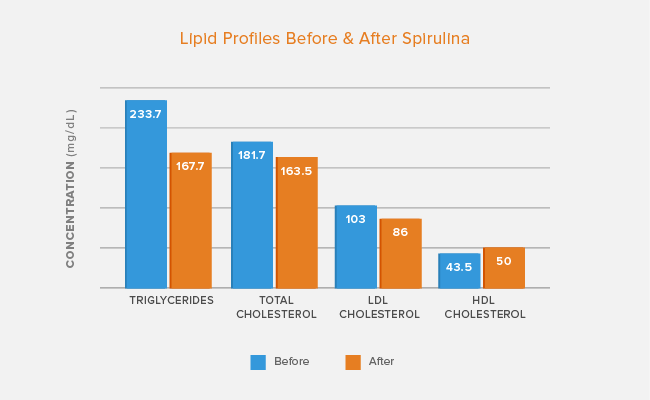 Spirulina lowers “bad cholesterol” (LDL), increases “good cholesterol” (HDL) while also lowering triglyceride levels and improving blood pressure. These are just some of the awesome supplements you should take on a Keto diet to see the results you are working so hard to achieve. It can be complicated keeping up with all your diet goals, exercise and nutrition all at once, but with some commitment and recognizing the importance of what you put in your body, it will become natural over time. The seven supplements you should take on a Keto diet includes fish oil, creatine, MCT oils, electrolytes, vitamin d, fiber, and spirulina. There are many other supplements you can add to your diet that will be beneficial to your health and Keto results, but these seven will be a good place to start.